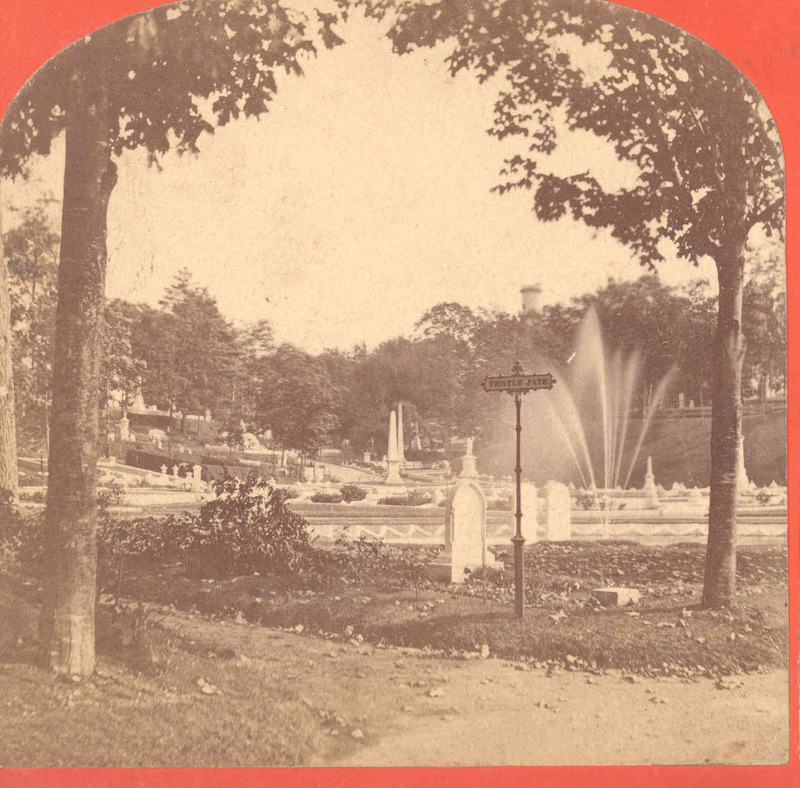 In November of 1862, Mrs. Mary (Augustus) Hemenway offered to pay Mount Auburn $6,000 if the Corporation would “construct a fountain opposite my lot in the low land between Thistle and Cowslip Paths equal to the fountains in the lawn, and which shall be kept running as long as that fountain, and if they will also convey to me by deed one half of the said low land . . ., to be forever kept open and in good condition.” With some modifications, the proposal was accepted and construction began. 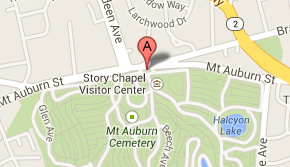 Prior to 1862, maps of Mount Auburn Cemetery show that the area now occupied by “Alice’s Fountain” was a low, wet bog. This meant that during construction, improvements to the surrounding area had to be made in order to allow for the addition of a fountain. These improvements included the removal of 14 feet of fill from nearby Laurel Hill to fill in a swampy area near Thistle Path. The completed project resulted in a large tile basin with a fountain that was capable of throwing a tall jet of water into the air. A map of the area from 1866 shows the fountain as being labelled “Alice’s Fountain”. Why the name “Alice”? Alice Hemenway, who died at the age of two, was the daughter of Mary Hemenway and the first interment made in the Hemenway Lot (#1463 on Thistle Path). Over the years, Alice’s Fountain and the surrounding area have undergone many changes that can be most clearly seen in photographs dating from the mid-1860s through the early 1900s. In many of these early photographs, the fountain and a number of lots in the area, are shown as being curbed with granite or as displaying ornamental lawn decorations (just some of the many fads at the time). Additionally, drawings and engineering files of the area that date back to the 1930s and 1950s also document the evolution of the landscape that surrounds Alice’s Fountain. Sadly, by the mid-1950s, Alice’s Fountain had fallen into disrepair- the fountain itself was no longer functioning and the basin was broken. 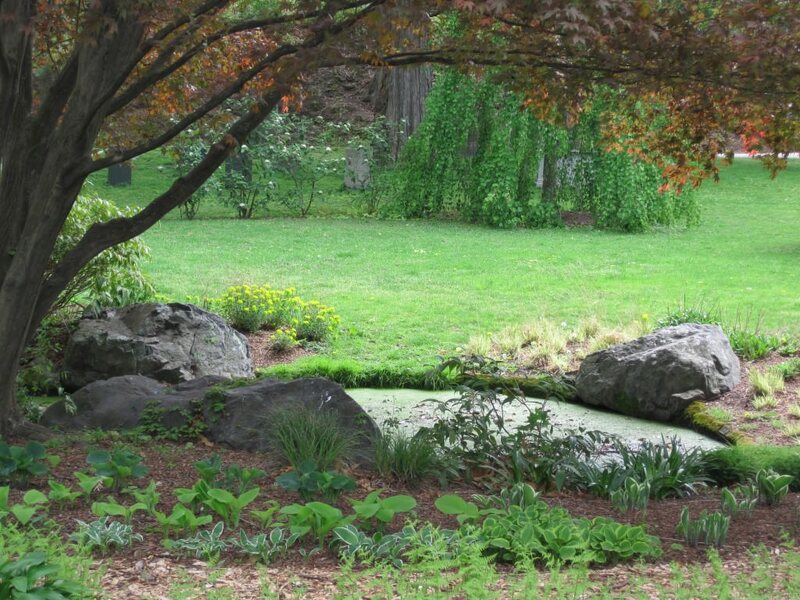 In an effort to restore the area, Hemenway descendants were consulted and a plan was drawn by Shurcliff and Shurcliff, Mount Auburn’s consulting landscape architects, to convert the tiled basin to a naturalistic pool with a drip fountain. By the fall of 1959 the new pool and plantings had been completed, thus transforming Alice’s Fountain into the beloved natural area that it is today.